Baltic amber is fossilized resin of pine trees from the Scandinavian area and about 44 million years old. At that time there was a relatively mild climate and the pine forest stretched out far into the Nordic area with trees up to 40 meters high. All together nicely imaginative piece of earth history that inspired Steven Spielberg in the making of the movie Jurassic Park. 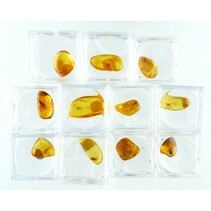 Amber works as a healing stone that removes negative energy from the body. Wearing amber jewelry promotes a good mood and depressive feelings diminish or disappear with ehwn wearing amber.